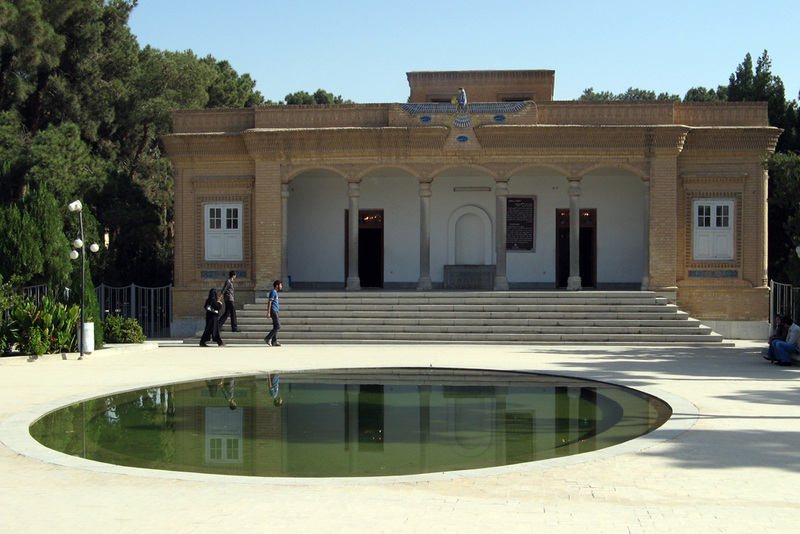 The city of Yazd is the main remaining Zoroastrian center in Iran. 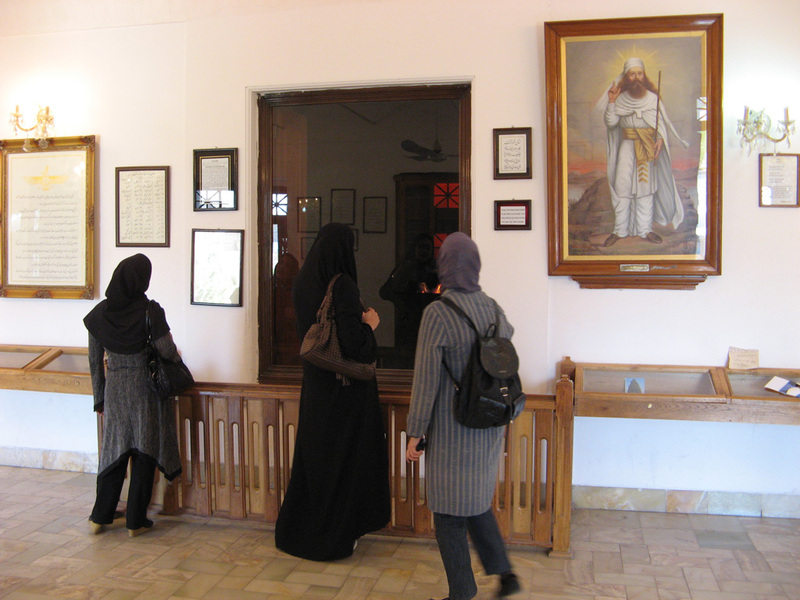 Zoroastrianism is (along with Christianity and Judaism) one of the three recognized and protected religious minorities under the Islamic Republic’s constitution. So worship and pilgrimages are officially tolerated, although probably not exactly encouraged. I hired a car and guide for the trip out to the Zoroastrian shrine at Chak Chak. We stopped first at one of the Zoroastrian Towers of Silence atop a steep hill near Yazd. The Zoroastrian religion forbids the polluting of the pure elements (especially water, earth and fire) with a corpse. So both cremation and earth burial were disavowed. 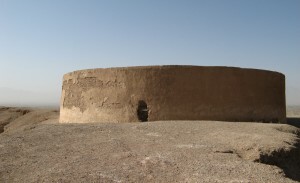 Instead, bodies were exposed to be devoured by vultures in these “towers of silence”. This is an odd inversion of the normal Christian or Muslim customs: the emphasis is not on preventing disturbance to the body, but rather on preventing the body disturbing the elements. The tower was much lower and flatter than I expected. It is really a circular wall, around 15-20 feet high, around a raised platform. This example is about 180 years old. According to my guide, after the bodies had been devoured by vultures, the bones were collected in a central hole and then periodically dissolved by nitric acid. It is now disused: the modern practice is to perform burials in concrete lined tombs. The Chak Chak site is about 73 km from Yazd and is revered as a miraculous place of refuge for the pious daughter of the last of the Zoroastrian Persian Kings. In 640 AD the Princess and a few retainers were fleeing in despair from the Arab invaders, across the Iranian desert. According to the tale, they were close to death from thirst when the Princess tapped her staff on a rock and miraculously a tiny drip-drip of water appeared. That drip-drip, in Persian “chak chak”, gives the name to the site. 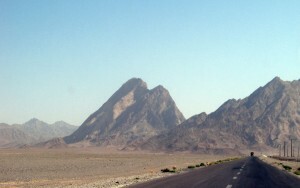 The site is on the side of a forbidding craggy mountain, a long drive from Yazd across an arid gravelly desert. The mountain side looks entirely dry and desolate. I can well imagine that after emerging from the desert, the discovery of an entirely unexpected tiny spring, literally only drips, may have well seemed like a miracle to the pious. 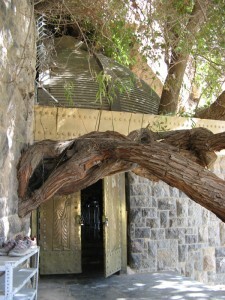 The shrine, at the top of many steep steps, is covered by a fairly recent dome and protected by a modern stone wall and stout bronze doors. 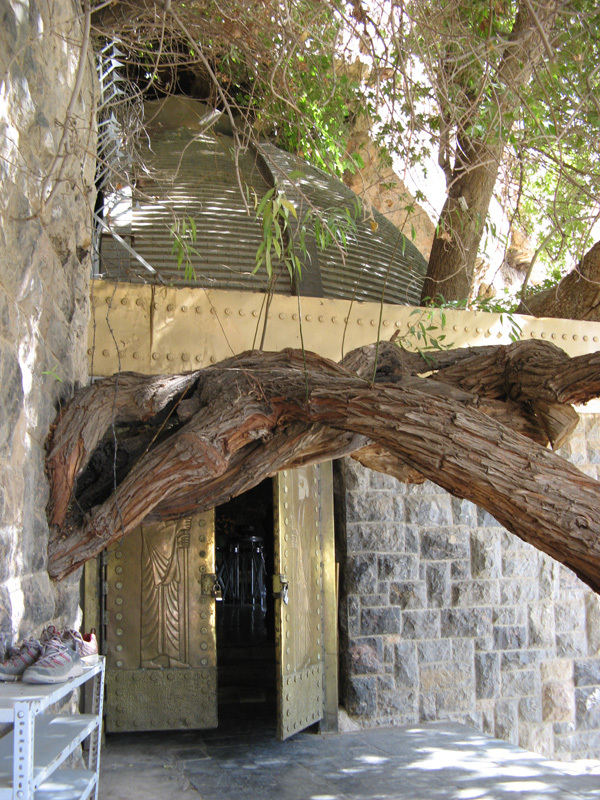 Tree trunks grow sideways out of the wall in front of the entrance. Inside, there is still a drip-drip of water, now being caught in silver bowls. It is a small site, but it is both simple and charming. 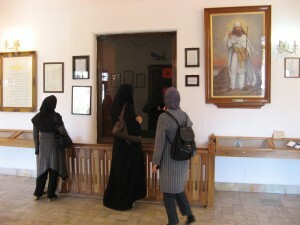 The shrine is the target for annual pilgrimages each June and various Zoroastrian communities have built their own hostels near the site, to shelter their pilgrims. 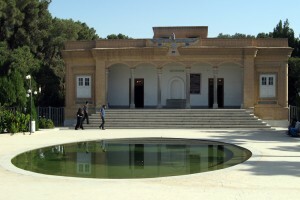 Back in Yazd, I visited the Zoroastrian Ateshga, or fire temple. The current building dates from only 1934, but the holy flame is reputedly the continuation of a flame that has been kept burning since 470 AD. The flame burns in an urn in a separate room, and we may only view it through a protective glass window. To complement the fire, there is a large water pool in front of the temple.